Helping you find the sights, sounds, and occasional smells of our buried waterways. The Peck is just one of many small streams draining the swampy flood plain that is South London, but it's an important and a fascinating one. 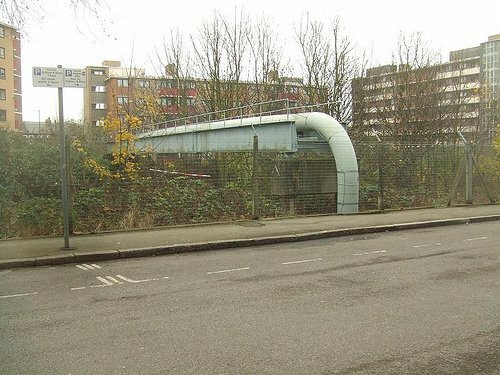 Together with its northern branch, known as the Earl's Sluice, this watercourse once drained a basin describing almost precisely the boundaries of the modern borough of Southwark. 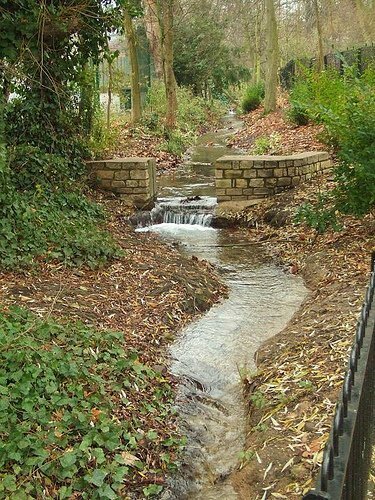 On its banks grew ancient settlements, one of which archaeologists have traced from a Mesolithic flint tool manufacturing site, through a civilian outpost of Roman Londinium, to the village of Peckham. 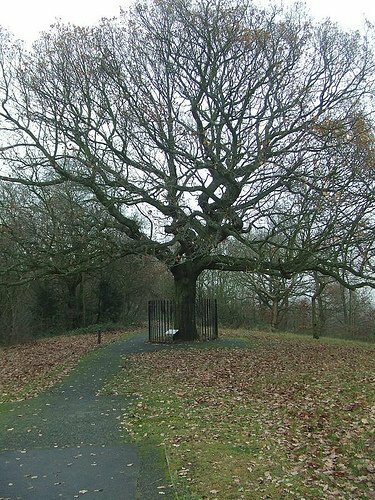 The highest source of the Peck is on One Tree Hill, a prominent rise on which stands the Oak of Honor. The current oak was re-planted in 1905, but the original received its grandiose name after Elizabeth I picnicked beneath it. From somewhere below the roots of this tree the Peck was once born. Today, the route is immediately complicated by human engineering. But what engineering! Honor Oak Reservoir was the largest underground brick reservoir in the world when finished in 1909, and it remains the largest in Europe. It lies beneath a rectangular hill and a nine hole golf course, inaccessible and difficult to spot from the road, but an orbital view makes its scale clear. Hydraulic engineering notwithstanding, streams will seek their level, and the Peck continues to flow from this area. 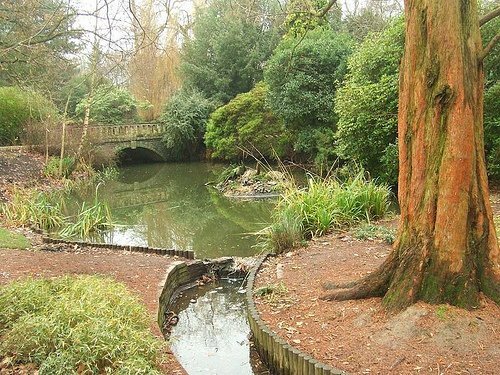 Only a quick hop down to Peckham Rye Park and it still looks like a stream, with a tributary running down artificial yet picturesque channels. After these global perambulations, the Peck disappears into a final portal to travel beneath the western edge of Peckham Rye Common. When rains are heavy the river has been known to appear on the surface here. On an ordinary day we have to content ourselves with the dip of its stream bed and a few hatches lining up with its direction of flow. 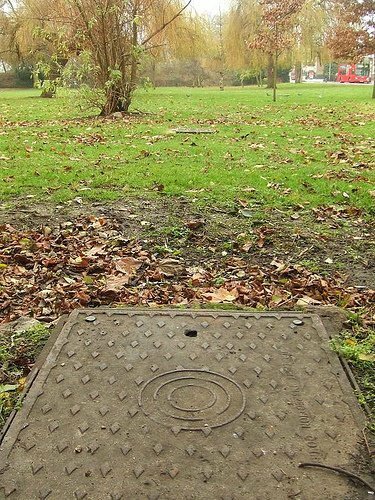 From here, like most of London's waterways, the culverted stream has long since become a sewer. There's nothing to be seen of the stream after it deviates from the Rye; not even the modern layout of streets betrays its course. 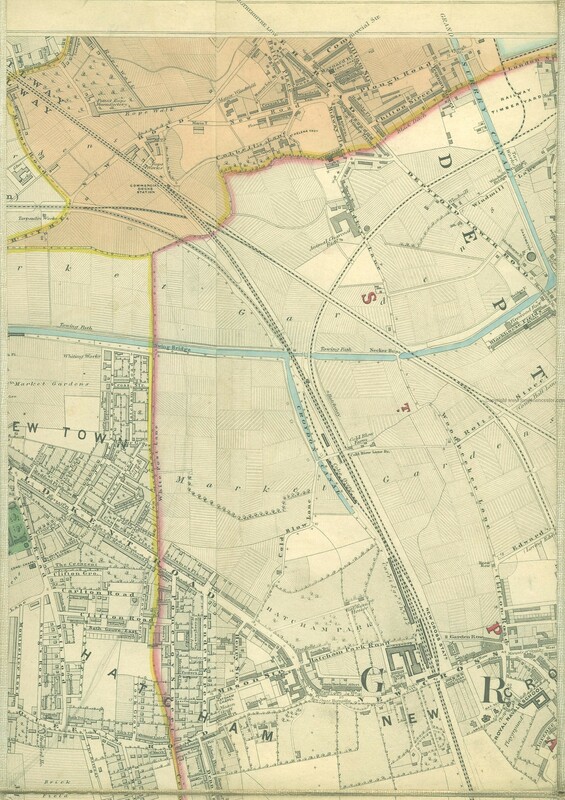 We can follow it best as the parish boundaries separating Deptford from Camberwell and Bermondsey, as seen in the highlighted lines on Stanford's Library Map of 1862-71. By this time it was already underground, except for the brief stretch labelled as the "black ditch." 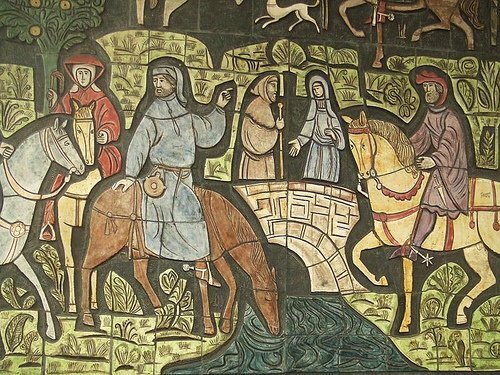 The spot where the three parishes meet is also where the Peck joins the Earl's Sluice. Ye weet your forword, and I it record. 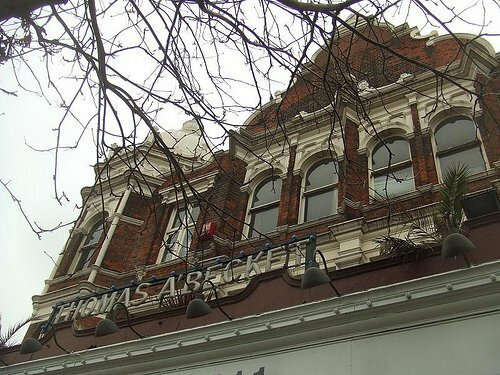 The Watering was reopened in the 1980s and still stands, though it's now become a ghost pub all over again, occupied by an art gallery. Behind, the alleyway of Shorncliffe Road marks the path of the Sluice, and a short walk down the Old Kent Road the pit stop is memorialised in the mural pictured in the gallery to this post. Long after Chaucer's day, the Earl's Sluice became the Earl Main Sewer in 1820-23. From where the Peck joins it, the sewer skirts to the north of Millwall FC's Den and alongside Rotherhithe New Road. Here, on the home stretch, the watercourse makes an unexpected return to arch over the rail line. But what of the mouth of the stream at Deptford? 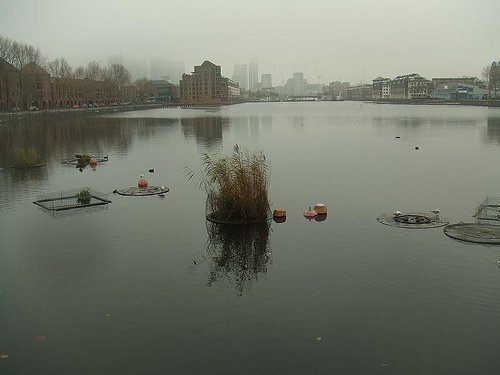 It initially lay alongside Greenland Dock, until it was finally widened out to form the connecting South Dock. This is where the course ends, with a view of Canary Wharf and some valuable dockside property. We can't prove that any vestige of the stream still empties into this basin, but at least there's plenty of water around to help us imagine it. See the approximate course of the Peck and Earl's Sluice alongside other subterranea on our Underground London map. Photos by M@. Much thanks to Peckhamites John Beasley and Sally Butcher for guidance in our explorations. To find other lost rivers, see previous entries in this series.